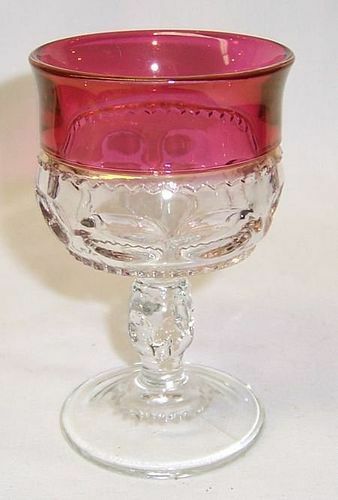 This really pretty Ruby Flashed Kings Crown 4 Inch high footed Cocktail was made by Indiana Glass. 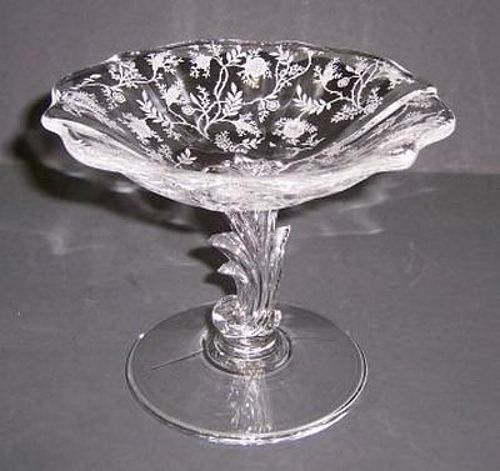 This Cocktail measures 2 1/2 Inches in diameter at the top and is in very good condition with no chips, cracks or scratches. The Ruby Flashing is all very good. Be sure to search our other Kings Crown available. We guarantee items to be as described. THANK YOU. 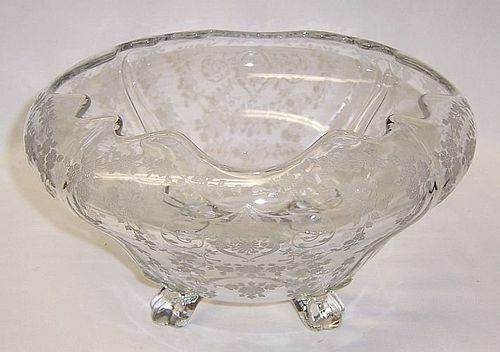 This pretty crystal clear Chintz 4 1/2 inch high Mint Comport was made by Fostoria Glass. The Comport measure 5 1/2 inches in diameter across the top and is in very good condition with no chips, cracks or scratches. 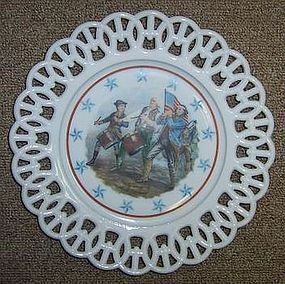 Be sure to search our other Chintz available. We guarantee all items to be as described. THANK YOU. 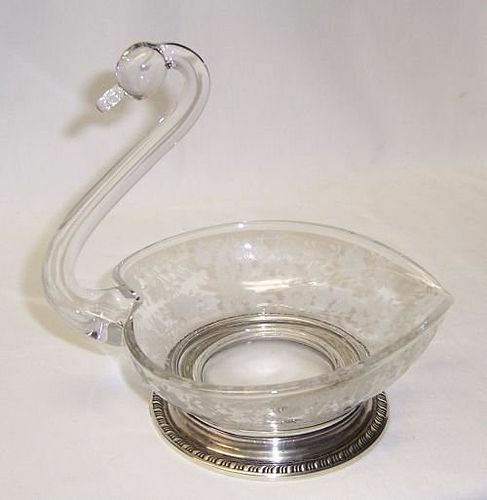 This very pretty crystal Prelude 6 inch high X 5 1/4 inch diameter Swan was made by New Martinsville Glass from 1936 to 1939. The Swan has a Sterling base - signed Sterling. It is in very good condition with no chips, cracks or scratches. We guarantee items to be as described. THANK YOU. 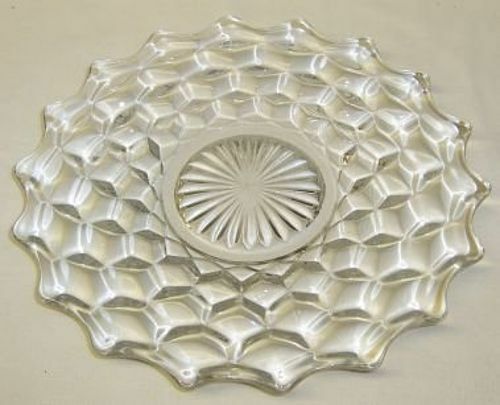 This pretty crystal clear American 7 1/2 inch Salad Plate was made by Fostoria Glass. 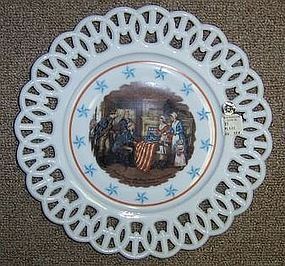 The Plate is in very good condition with no chips or cracks. There are a few very light surface scuff marks on the plate. Very minor but there. Be sure to search our other Fostoria glass available. We guarantee items to be as described. THANK YOU. 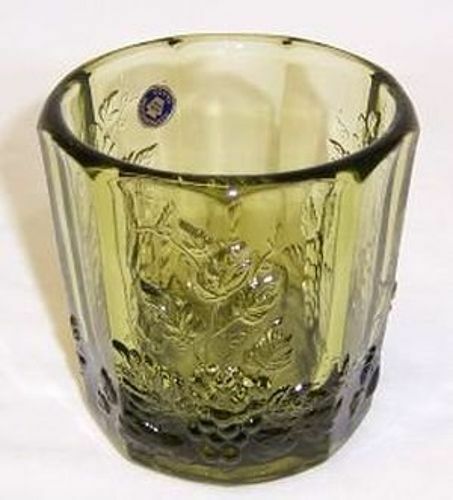 This is a really pretty Olive Green Paneled Grape Old Fashioned Tumbler made by Westmoreland Glass. This Tumbler measures 3 1/4 Inches high X 3 Inches in diameter at the top. It is in great condition with no chips or cracks. The original label is attached. Be sure to search our other Westmoreland glass available. We guarantee all items to be as described. Feel free to email with any questions. THANK YOU. 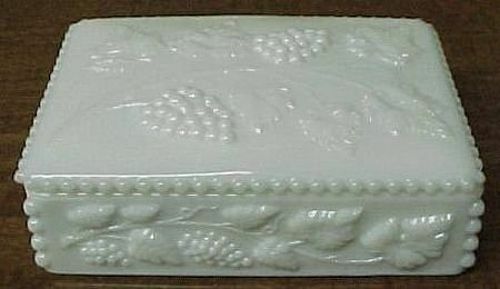 This pretty milk glass Beaded Grape Cigarette Box with lid was made by Westmoreland Glass. The cigarette box measures 5 3/4 inches X 4 1/8 inches. It is in very good condition with no chips or cracks. It is signed WG. Be sure to search our other Westmoreland available. We guarantee all items to be as described. THANK YOU. This really great milk glass Cherry and Cable Handled Cookie Jar with Lid was made by Westmoreland Glass. The Cookie Jar bottom and lid are both signed WG. Both the bottom and lid are in very good condition with no chips or cracks. There are a couple usual mold lines in the piece common to the heavy milk glass. Be sure to search our other Westmoreland available. We guarantee all items to be as described. Feel free to email any questions. THANK YOU. 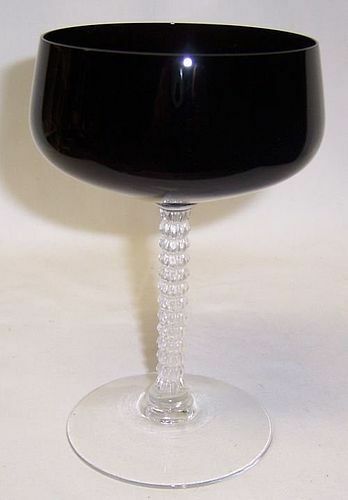 This really pretty Onyx Black with Crystal stem Number 6108 Precedence 5 3/4 inch high Sherbet was made by Fostoria Glass from 1967 to 1974. It is signed Fostoria on the bottom of the foot. This Sherbet measure 3 1/2 inches in diameter across the top. It is in very good condition with no chips, cracks or scratches. We guarantee items to be as described. THANK YOU. 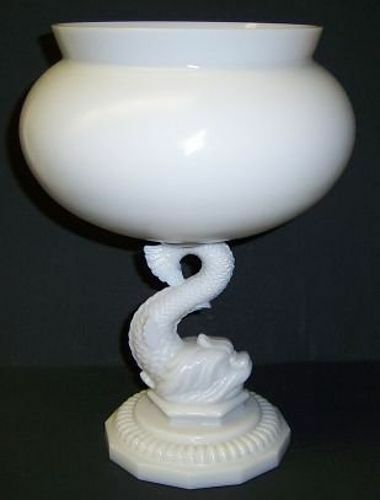 This really pretty Pheasants decorated Crystal Glass Globe with Wooden Base Candle Lamp was made by Westmoreland Glass. This Candle Lamp measures 8 inches high together. The Globe measures 7 inches in diameter. Both the Glass Globe and Wooden Base are in excellent condition with no chips or crack. This Lamp is in its original box. The Pheasants decoration is all excellent. Be sure to search our other Westmoreland glass available. We guarantee all items to be as described. THANK YOU. 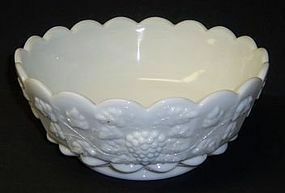 This pretty Milk Glass Paneled Grape Round Straight Sided Bowl was made by Westmoreland Glass. 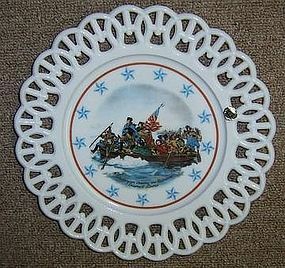 This Bowl measures 8 1/2 Inches in diameter X 3 3/4 Inches high. It is signed WG and is in very good condition with no chips, cracks or scratches. Be sure to search our other Westmoreland glass available. We guarantee all items to be as described. Feel free to email with any questions. THANK YOU. 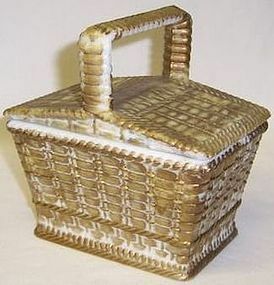 This is a really nice milk glass with Antique Gold painted accent 2-Piece Picnic Basket made by Westmoreland Glass. This Picnic Basket is signed WG. It measures 5 inches long X 5 inches high to top of handle. It is in very good condition with no chips or cracks. Be sure to search our other Westmoreland available. We guarantee all items to be as described. THANK YOU. 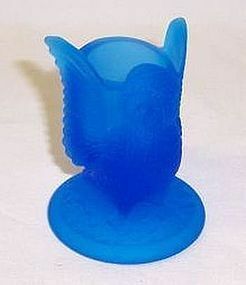 This pretty 2 1/2 inch high Brandywine Blue Mist Glass OWL Tooth Pick Holder was made by Westmoreland Glass. This Tooth pick is signed WG on the bottom. It is in very good condition with no chips or cracks. Be sure to search our other Westmoreland available. We guarantee all items to be as described. THANK YOU.